The Intimus A0091977 One Station TSi 4: Inserter with Optical Mark Recognition (OMR) automates all standard mail management services and direct marketing applications with its easy-to-use, 5.7-inch graphic touch screen and step-by-step wizard that can save up to 15 jobs in its memory. The Intimus Inserter combines a folder inserter, mailing machine, letter folder or enveloping machine that can save you time and money. The Intimus TSi 4 can fold up to 5 sheets of documents at a time in to Letter, Z, single, double parallel or no fold. 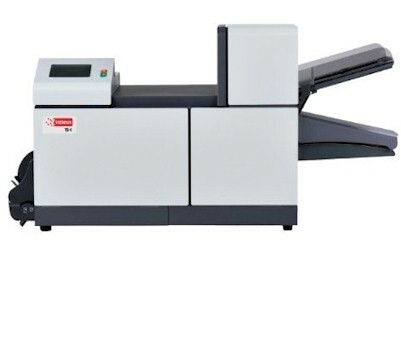 This One Station TSi-4 Inserter also features one A4 feeder and an Optical Mark Recognition (OMR) scanner system that automatically stops the machine should the contents of a mail piece be incorrect, guaranteeing the integrity of your mail. The Intimus A0091977 One Station TSI 4: Inserter is here to cater all your mailing needs. Accepted Paper Weights: 16 - 28 lbs.